The Film Corner with Greg Klymkiw: JUST EAT IT: A FOOD WASTE STORY - Review By Greg Klymkiw - HOT DOCS 2014 - Experiment an eye-opener. JUST EAT IT: A FOOD WASTE STORY - Review By Greg Klymkiw - HOT DOCS 2014 - Experiment an eye-opener. because there are simply far too many stupid people in the world. Vancouver residents Grant Baldwin and Jenny Rustemeyer seem like your normal garden variety bourgeois couple, replete with a fix-it-upper older home with trendily remade/remodelled interior design/decor, so why, you might ask, do they eat from garbage bins? Well, to make this film, of course. Appalled by the statistics of how much perfectly edible food is wasted in both farms and retail outlets, they undertake a grand and thoroughly worthwhile six-month-long experiment to not consume any food they have to buy. Along the way, we experience their endless search for good quality food dumped by stores in bins, product headed for dumping on the final best-before date and on occasion, seeing director Baldwin and producer Rustemeyer paying for severely marked down food that will be dumped if not purchased (this is the one exception to the "do-not-buy" rule). Some stores refuse to give and/or sell the food, using the stupid excuse that their policy is to sell only the freshest product. Some of them even deliver the bald-faced lie that it's a healthy department by-law (which does not, for all intents and purposes actually exist). Chances are that many of the grocers dump perfectly good food in the moronic fear that they'll be liable for lawsuits if the food has gone bad. Of course, the food we see, has not gone bad at all. One of my local grocers - a franchise chain owned by Sobey's - slaps a "manager's special" sticker on such food and I buy it all the time. I'm not dead yet and as I write this, my fridge is stocked with several cartons of freshly squeezed orange juice, not from concentrate, all past the best-before date. They set me back a whopping $1.79 per carton and taste just fine. They'll continue to do so until every last drop goes down my family's gullets - unless, of course, I guzzle them all back first. If I have a tiny quarrel with the movie, it's that it doesn't clearly identify the stores that pull this sort of crap and part of me wishes there was some Roger and Me-styled stalking and shooting of CEOs of the chain stores that encourage blatant food waste. It's not really enough to get worker-dweebs and store managers to address the issue - the big boys need to been taken down a few notches. The movie is a mere 75 minutes and I suspect no audience would have had an objection to a slightly longer running time if one could have had the added value of nailing the corporate dicks to a few crosses. At the farms, the film demonstrates how perfectly fine vegetables and fruits are dumped strictly for "aesthetic" reasons. If the food doesn't "look" good, retailers won't buy it because most of their stupid customers won't buy anything with slight bumps, bruises, "off" colouring or even worse, that don't look identical to all the other foodstuffs available. The movie introduces us to a variety of experts in the field of ecology and it's here we get a sense of just how ridiculous the waste of food actually is in North America. The worst part is that the tossed edibles are not even properly recycled as compost, but end up in landfills. Yeah, really great for the environment, dork-wads. 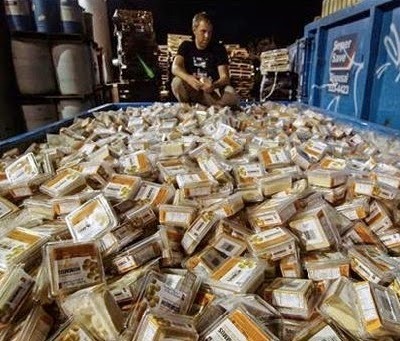 An entire dumpster full of hummus. Just Eat It: A Food Waste Story is an informative and entertaining look at an environmental issue so many of us might never think about. I must admit, though, that as an el-cheapo Ukrainian, I'm always looking for stuff at reduced prices once it's past the best before date. El-cheapos are often the best environmentalists. One of the most shocking things to see in the movie - especially to me, because I love the stuff - is when Baldwin comes across an ENTIRE dumpster full of hummus that's NOT even past the best before date. You know, most people who sell food and those who shop for it, are complete and utter morons. For those of us who aren't, hopefully the movie will be a massive clarion call to do exactly what our filmmaking couple do. You'll save a ton of dough AND help the environment. Better yet, let's hope the movie cracks open the craniums of those who have little brain to begin with and allows the importance and urgency of this issue to filter through their dim-bulb cerebella. Better yet, ask your grocery store what they do with stuff on or past the best-before date. If they lie and say it's a health department issue, (or worse, simply use the "best quality product" policy excuse) boycott the store. Let them know you're doing it, though. You might get some coupon incentives, gift cards and/or other valuable incentives to keep shopping there. Use up the freebies and discounts, to be sure, but keep shopping loyally at stores that give you what you want. It works for me!!! 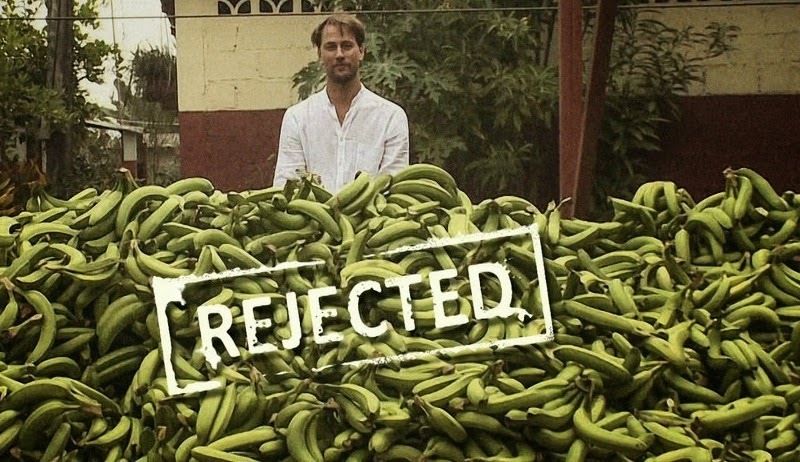 Just Eat It: A Food Waste Story is playing at Hot Docs 2014. Visit the festival website for ticket, playmate and venue info HERE.